For the Arts Voyager’s full illustrated commentary on the Rencontres de la Photographie held last summer in Arles, France, subscribers please contact paulbenitzak@gmail.com. Not yet a subscriber? Subscribe today for just $36/year by designating your PayPal payment to paulbenitzak@gmail.com, or write us at that address to learn how to pay by check. Above, from the Arles exhibition The Train: RFK’s Last Journey: Paul Fusco/Magnum Photos, Untitled, from the series RFK Funeral Train, 1968. The exhibition is part of a mini-festival within the festival, America Great Again, also featuring work from Robert Frank, Raymond Depardon, and others. Robert F. Kennedy was assassinated in Los Angeles 50 years ago this month, at the apex of the Democratic presidential primaries. Courtesy of the Danziger Gallery. “Le bel indifferent No. 1,” France, 2009. Digital print, 45 x 45 cm. Copyright Laurence Leblanc and courtesy Flair Gallery. The title echoes that of a radio play written by Jean Cocteau for Edith Piaf. Based in Arles — the provençal city best known outside France as the place where Vincent Van Gogh scalded his scalp, fried his brain, and cut off his ear before being hounded out of town by irate citizens to most of whom he was not the bridge between Impressionism and Modernism but “that crazy redhead” — the Flair Gallery was founded in 2015 by Isabelle Wisniak, another redhead, whose gestalt makes her crazy like a fox. All the art programmed by Wisniak is related to animals and advancing human understanding of their kingdom. But attention: Wisniak, whose pedigree includes working for the fabled FNAC photography galleries and for temporary exhibitions at the Conciergerie (where Marie Antoinette and Danton lost their heads — both the FNAC and Conciergerie spaces are rooted in Paris archeology), is not interested in cute cat pics. The art she promotes is not just fueled by noble sentiments but solid ideas. The result is creators whose work is as aesthetically intriguing as it is politically stimulating, addressing both technical and moral questions. For her exhibition this spring in the Church of the Friar-Preachers, organized by Wisniak, Caroline Desnoëttes erected chapels dedicated to apes (among other “graphic safaris”), a juxtaposition which might have tickled Clarence Darrow, defense attorney at the Scopes monkey trial (and, like Van Gogh, a subject of historical novelist Irving Stone) which pitted creationists against Darwinists. She also coordinated Desnoëttes’s street-perambulating expos Eléphantomatiques and Portraits d’Arlésiens hybrydes and is hosting, through today at her gallery on the picaresque rue de la Calade in the heart of the old city, Grandeur Nature, offering paintings and drawings by the Paris-based author and designer. “Palette singe 8,” 2017. Drawing by Caroline Desnoëttes. Ink on Japanese paper, 135 x 150 cm. Copyright Thomas Julien, and courtesy Flair Gallery, Arles. It’s this tribal bond that strikes me in Desnoëttes’s 2017 ink drawing “Palette singe 8,” in which the ape echoes the simian-human connection traced by Eugene O’Neill in “The Hairy Ape,” only in reverse, the pensive monkey’s expression seeming human; you want to ask him what he’s pondering. “Full moon panther 4,” also created last year, reminds me both of the panther that used to pace poignantly back and forth, like its polar bear brother neighbor, in the confines of a 20-foot long cell in the San Francisco Zoo (where the apes were more inclined to interact with the public, throwing their caca at anyone who got too close to their perch on “Monkey Island”), quietly going mad, and its relative in Jacques Tourneur’s 1942 “Cat People,” where feline empathy was also stirred up by the purring Simone Simon (Eartha Kitt had nothing on her), into whom the panther metamorphosed when the Sun came up. “Panthère pleine lune 4,” 2017. Drawing by Caroline Desnoëttes. Ink on Indian paper, 90 cm. Copyright Thomas Julien and courtesy Flair Gallery. The presence of an art gallery sensible to animals in this particular geography is not anodyne. When I mentioned to a friend that I was thinking of moving to Arles (because of the literary and art scenes, as well as the proximity to the Camargue and potential horse work), he praised its Bohemian ambiance and artistic nature, but said he was distressed by the area’s “Tauromaché.” Having spent several years living in semi-rural villages in the south of France, my own view on humans who kill animals has evolved. From their daily proximity with nature, my hunter friends have a grand respect for and understanding of animals. But even if they are distinguished from bull-fighters in eating everything they kill — thus an argument of utility can be made — hunters like matadors are engaged in sporting matches in which their opponents are involuntary participants. (Though it might be argued that at least bull-fighters risk own their lives.) It’s the humans who have determined the rules of engagement and manipulated the balance of power. Its defenders argue that bull-fighting, or Tauromaché, is also an art. With a view towards supporting this thesis, I broke out a collection of Editions David postcard reproductions I have of Picasso’s aqua-tint illustrations of the famous Pepe Illo bull-fighting scenes. Published in 1957 in Barcelona by Gustavo Gili for its “La Cometa” editions, Picasso executed them after attending the bull-fights in the Roman arena of… Arles. Several of the tableaux indicate how ridiculous the contest is with its inflated pomp: The matador parading into the arena with his coterie of marching and mounted attendants, primping like a bride, or being applauded after having vanquished the bull in a match that was ultimately rigged because the humans set the rules. Others, however, depict the respect in which the beast is held: The matador kneeling before the bovine, spreading his cape out on the ground between them as if in tribute, or saluting an animal opponent proudly clenching a morsel of torn cape between his teeth. Another shows the opponents facing off on visually equal terms, at least as far as the arena goes: The bull standing in attendance, the matador seated and gently waving his cape towards the animal as, in the foreground, another matador and an elegant woman in a lavish hat watch from the rungs. I’m less sure about the elegance of another which shows the audience and matadors in the shadows, the bull standing under blazing floodlights; is he the honored star or the spectacle, like the Kroebers’ Ishi in Berkeley? But my favorite is a village-scape which depicts the townspeople mounting, by foot, burro, truck and cart the gentle hills in the foreground to the Arles arena in the background. It’s an occasion. It’s a culture. You can say it’s not a civilized culture because it’s not your culture and you weren’t raised in it, but is it really so barbaric as all that? Another tableau — and perhaps the one the Taurus in me, who takes Ferdinand as his model, identifies with the most — pictures the bulls reposing in the countryside, monitored by a single guardian (albeit one armed with a spear). In Texas, we don’t kill our bulls, we just taunt them until they’re mad enough to charge. When I caught the Rodeo & Stockyard show in Fort Worth — the largest and oldest indoor rodeo in the world – in 2012, a bull twice the size of the cobalt ones who gambol among the marshes of the Camargue, to which Arles is the gateway, nearly succeeded in hurtling the barrier which separated his pen from the stands and mounting in the press seats. (If you want to tame the media jackals, put them next to the bull pen.) He was finally lured into the arena by the clown, the most courageous human player in the rodeo, with only a thin barrel protecting him from the horns. Before a gig working as ranch chef and stable boy on a Texas pony farm later that same year, my closest exposure to horses — my equine fix — came from strolling through the large hangar at the stockyard show, where I found the aroma of horse-dung as intoxicating as some in the South of France find prune eau de vie. After paying my respects to Ben Shahn’s “Comics,” a towering painting on the mezzanine level portraying a boy reading the funny pages before a vast wall, I ambled into the Russell exhibition and sidled over to where an older cowboy, a slightly younger cowboy, and an eternally young cowgirl whose long grey-black hair fell in two braided tresses over her plaid shirt and blue jeans had paused in front of “The Challenge No. 2,” a tableau from 1898 in which two wild horses are pitched in battle. With my dark-brown garage-sale cowboy work-boots, snap-button silver shirt, red bandana (came with the boots), black Dickies jeans, broad-brimmed straw cowboy hat with the longhorn emblazoned on its flaming orange band and, facsimilating the jingle of spurs, the collars of my three dead cats dangling from my wrist, I hoped to be able to pass. Charles Marion Russell, “The Challenge No. 2,” 1898. Watercolor. Bob and Betsy Magness Collection, Denver Art Museum, 52.2005. From the exhibition Romance Maker: The Watercolors of Charles M. Russell, which showed at the Amon Carter Museum of American Art and at the C.M. Russell Museum in Great Falls, Montana in 2012, as earlier published on the Dance Insider & Arts Voyager. This is what art at its best does; it distills life, using technique to reflect it back to the observer in a way that doesn’t just evoke physical recognition but resonates and stimulates not only intellectually, but emotionally, sensually, and spiritually. Eugène Delacroix (French, 1798–1863), “The Education of Achilles,” ca. 1844. Graphite, 9 5/16 x 11 11/16 inches (23.6 x 29.7 cm). The Metropolitan Museum of Art, New York, Gift from the Karen B. Cohen Collection of Eugène Delacroix, in honor of Emily Rafferty, 2014 (2014.732.3). “Famous Mare 1,” France, 2016. Copyright Laurence Leblanc and courtesy Flair Gallery. From the exhibition “The Medium and Its Metaphors,” first covered by the AV in 2012: Eadweard Muybridge (1830-1904),”Dan with Rider (.064 Second), One Stride in 8 Phases (Left Lead),” ca. 1887. Collotype. Amon Carter Museum of American Art P1970.56.13. At first glance, the Leblanc made me think of the Muybridge. On closer examination, I realized that in the Muybridge, the rider is beating the horse; in Leblanc’s tweaking of the 1927 photo, the horse is staring down the stable boy (on whom Leblanc seems to have performed a digital equarissage operation), challenging the master-subjugated relationship. I can’t over-state the global resonances this image by Leblanc, nor another, “Famous Mares No. 3,” suggested to me, nor the personal catharsis they delivered. What started me on the trail to Wisniak’s gallery was discovering yet another major arts institution whose otherwise noble mission has been compromised, in my view, by the profile of one of its main supporters. In the U.S., this has been most infamously manifest by institutions like New York City Ballet and the Metropolitan Museum accepting large donations from the Koch Brothers (funders of phony science debunking global warming and anti-Labor politicians, among other nefest causes) and, in the case of the Met, the Sackler family (owners of Perdue Pharma, linked to the opiate crisis plaguing the United States, and who have lent their name to the Met wing housing the Temple of Dendur). Instead of getting up on my high horse again and ranting the institution in question, this time I thought I’d try to scout out arts institutions who, in lieu of accepting and parlaying with the world as it is, agitate for the world as it ought to be. By focusing on art related to animals — *and* in a place like Arles with its embedded Tauromaché culture — Wisniak is militating for the cause of animals in the largest sense, getting us on their side by enabling what artists do best: Teach empathy. On a personal level, contemplating Leblanc’s photos re-imagining the rapport between the horse and the stable boy stirred a memory like those of the Texas cowboys before the Russell watercolor – and, like the protagonist of Herman Hesse’s “Journey to the East,” started me on the road to seeing an episode of my past in a new, more positive light. When I insisted PJ watch an episode of Bonanza with me in the bunkhouse we shared, what struck him most was the ponds. “We don’t have those in New Zealand.” PJ loved horses so much that for the six months he was obliged to remain in New Zealand, he worked as a horse truck driver just so he could be near them. One morning I asked PJ how he was doing. “Any day when I wake up to discover I didn’t die in my sleep is a good one.” My own proudest moments came when I was put in charge of feeding a trio including “the blind mare” in a pasture closer to our bunkhouse than the main house, which meant I got to ride the golf-cart out there, usually in the company of several canine passengers who jumped in as soon as I got rolling. As they enter a Sierra mining camp in Sam Peckinpah’s 1962 “Ride the High Country,” the horses are all that’s keeping Mariette Hartley, Ron Starr, Joel McCrea, and Randolph Scott from looking like what they are: Two greenhorns and two over-the-hill cowpokes. Image courtesy Cinematheque de Toulouse. One late afternoon after I’d finished helping PJ with the feed and stable cleaning and prepared the galette batter for the evening human feed, crossing the pastures that separated the main house from the one I shared with PJ, I decided to take a detour and enjoy my ‘knock-off’ beer (in French, “aperitif”) on a dilapidated couch PJ had installed in the midst of an overgrown field where a baker’s dozen of horses were left to roam. Sinking into the sofa in a position that proscribed a quick exit, I looked up to see 14 very immense horses standing 25 feet away slowly turn their gaze towards me; or as Desnoëttes might put it, “debusquing” me. I can’t say the episode totally evacuated the fear of horses that accompanies my attirance to them. (Much as I’d like to, the human horse hero I identify with the most is not Joel McCrea, but 12-year-old Scarlett Johannsen in “The Horse Whisperer,” alternately drawn to and terrified of the animals after a pal gets fatally tossed by a panicked mount.) But it was the most bare moment I’ve ever had with horses, and one of the most bare moments I’ve ever experienced in my life, just a moment of being: with the animal, with my intimidation in his presence, with advancing to the limit of my fears, as modest as that front may seem in comparison with the dreads that torment others, including my own cowboy heroes; this was my ravine, not navigating its precipitating edges on my pony, but simply approaching them and accepting what that felt like. To share, even if only for a moment, the universe of these belles indifferentes. PBI’s next destination? : Horses and water in the Camargue, outside Arles. “Famous Mares 3 ,” France, 2016. Copyright Laurence Leblanc and courtesy Flair Gallery. Paul Ben-Itzak’s new 40-page Memoir, including art by Ansel Adams, Robert L. Berry, Lou Chapman, James Daugherty, Gustave Caillebotte, Jacob Lawrence, Sylvie Lesgourgues, David Levinthal, Roy Lichtenstein, Sam Peckinpah, Charles M. Russell, Saul Steinberg, and Frank Lloyd Wright from both current exhibitions and the AV Archives, is now available. To receive your own copy as a PDF or Word document, including 35 illustrations, please send $19.95 to the AV by designating your PayPal payment to paulbenitzak@gmail.com, or write us at that address to learn about payment by check. Your purchase includes a complimentary one-year subscription to the Arts Voyager and Dance Insider ($29.95 value). Above: Saul Steinberg, “Train,” From the exhibition Along the Lines: Selected Drawings by Saul Steinberg, on view through October 29 at the Art Institute of Chicago. Poster designed by Michèle Forgues and Federica Nadalutti, and courtesy Ateliers d’Artistes de Belleville. Click here to read the Arts Voyager’s coverage of last year’s Open Studios / Portes Ouvertes de Belleville, and here to read our essay around the 2010 edition. And for more details on this year’s version, go here. Affordably-priced Sponsor ads are now available for the Arts Voyager’s upcoming coverage of performances and exhibitions from all over the world coming to Paris this Spring and Summer. Rates start at just $69 when you sign up before May 15. For more information, e-mail paulbenitzak@gmail.com by pasting that address into your e-mail browser. Parce que oui, la Culture française – comme d’ailleurs tous les cultures qui déferle vers Paris – appartient au monde qu’elle a si souvent rayonné, et il faut refusé de la laisse etre confiné et sequestré par les forces de l’Obscurantisme. 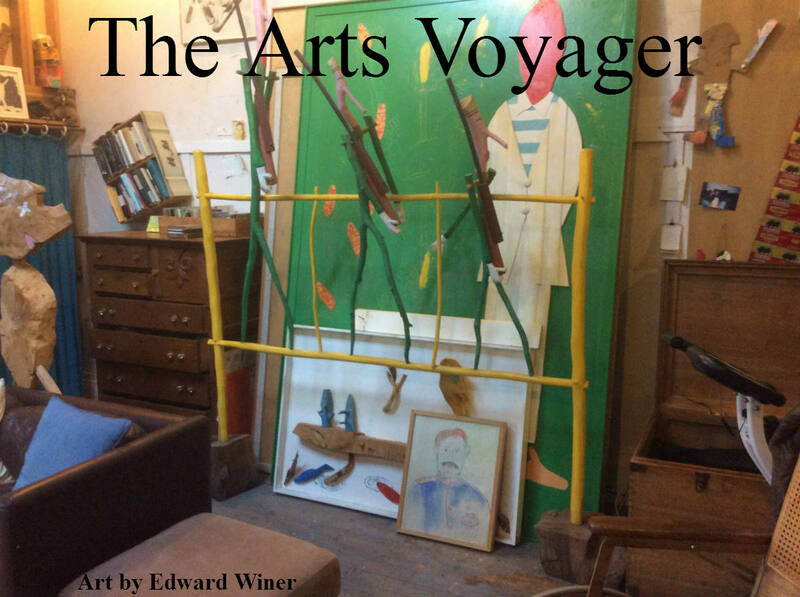 For subscription and sponsorship opportunities starting at $69, contact Paul Ben-Itzak at artsvoyager@gmail.com. The Open Studios or Portes Ouvertes de Belleville and those of the Prè Saint-Gervais, performers including Berlin’s Constanza Macras, Portugal’s Vera Mantero, a major exhibition devoted to Camille Pissarro paintings rarely seen in France, Belgium’s Alain Platel, Spain’s Israel Galvan, Crystal Pite — these are just a few of the major cultural happenings in Paris and environs this Spring that the Arts Voyager and Dance Insider will be able to cover with your support. Many of you first read about these internationally renowned artists and events for the first time in English in our journals and, continuing our 20-year mission of bringing you stories not told elsewhere, we’ll also be reporting on Giulio D’Anna, a Netherlands-based Italian choreographer whose “OOOOOOO” is inspired by Zagreb’s “Museum of Broken Relationships,” and Jasna Vinovrski’s “Lady Justice,” addressing the relationship between justice and art. Speaking of art, we’d also like to bring you Yasmina Reza’s “Art” as interpreted at the Theatre de la Bastille by the pioneering Belgium theater company STAN . And of intersections between art and society, this year’s Chantiers (Building Projects) d’Europe festival at the Theatre de la Ville features countries in the front lines of the refugee crisis, notably in six short films from Greece addressing this topic and a public brainstorming session with artists from six countries. Most of all we’ll be able to bring you into the studios of the 200+ artists taking part in the Open Studios of Belleville — a neighborhood which in its very MULTI-CULTURAL contours and dimensions provides the best retort to the cloistered vision of French culture represented by the National Front. (We share the FN’s stated pride in traditional French culture; we simply argue that this definition is too limited and does not do justice to the grandeur and ouverture to the world that has always been French culture.) Click here to read our coverage of last year’s Open Studios / Portes Ouvertes de Belleville. Already a subscriber or sponsor? Please forward this story to your colleagues. Want to become one? Contact us at paulbenitzak@gmail.com . Subscribers receive full access to our 20-year archive of more than 2,000 reviews by 150 leading artist-critics of performances on five continents, plus five years of the Jill Johnston Letter as well as Arts Voyager art galleries, film reviews, and travelogues from Paris, New York, and across the U.S.. Sponsors receive this plus advertising on The Dance Insider, and/or the Arts Voyager. Abbie Hoffman, "Steal this Book"
Boris Vian "L'equarrissage pour tous"
Eugene O’Neill “The Hairy Ape"
F. Scott Fitzgerald "The Great Gatsby"
John Leonard's "The Naked Martini"
Now! Hairy Who Makes You Smell Good! Sam Peckinpah "Ride the High Country"
Scarlett Johannsen "The Horse Whisperer"